Before returning with their latest single, 'I Love You', the ladies of 2NE1 were in Cannes, France to attend the Cannes Lions International Festival of Creativity. Besides performing to 'Can't Nobody' at the event, they were photographed by Lee Boo Kyoung for August's issue of W Korea. The photoshoot took place in the streets of Cannes, they were dressed in luxurious fashion from Balmain, Chanel, Corrie Nielsen, Karl by Karl Lagerfeld, McQ by Alexander McQueen, Stella McCartney, Piers Atkinson Phillip Treacy and more. 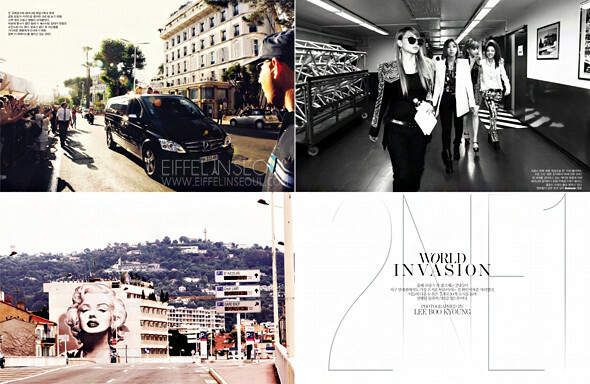 Check out the editorial entitled, 2NE1 World Invasion.